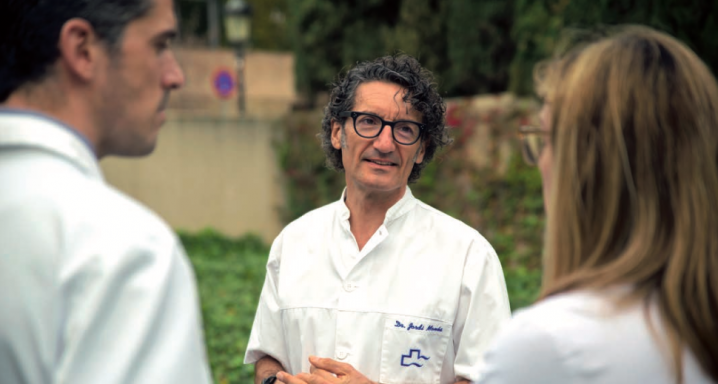 The aim of Dr. Jordi Monés (Barcelona, 1961) on creating the Institut de la Màcula 10 years ago was to direct «all our efforts and knowledge» towards the treatment of macular and retinal degeneration. This highly specialised medical and research team gave rise to the founding of the Barcelona Macula Foundation (November 2011), whose vocation is to form part of and contribute to the knowledge hub that comprises Catalonia’s Research Centres. The two institutions have grown and share the purpose of «providing first-class care for our patients and pushing forward the frontiers of knowledge, especially in those eye diseases that remain incurable today». When you created the Institut de la Màcula 10 years ago the treatments for wet AMD had barely begun. Have we now tamed this pathology? We have experienced a revolution: remember that wet AMD was — is, if it is not treated — a devastating pathology. To stop it we need two things. First, a good diagnosis. To address it effectively we have to know what lies ahead. If you don’t know your opponent he can beat you in many different ways. We lay great emphasis on the diagnosis phase and treat it with real attention and diligence. And what is the other element? Acting fast, using a model of active defence. This is also vital. The treatments for wet AM are highly effective. We stop the pathology because we know how to do so. But, once it is diagnosed, we need to be constantly vigilant and to administer the appropriate drugs with a frequency that does not allow any room for it to progress. Because we might not be able to reclaim the territory we let the disease occupy. And we will never be able to recover the tissue that is lost? At present, no. We in the scientific community are working on this on different fronts. We say that in 10 years we will have effective, proven cell regeneration therapies but this could be a little earlier … or a little later. Is this what is happening with atrophic AMD too? For atrophic AMD we are looking for solutions that are based on gene therapies and with stem cells, yes. Was this the path that you mapped out mentally when you founded the Institut? We based our approach on the treatments for wet AMD, which were then emerging, and on the very important experience that has been gathered over the years. Some people place us among the benchmark centres for AMD in Europe. We are pleased about this but we must not allow ourselves to be distracted. There is a lot of work to do. The Institut undertakes research projects very actively and participates in clinical trials in all their phases (I, II and III) while the BMF complements the clinical research carried out by the centre with preclinical research or basic studies. In this way, the projects we share, such as regenerative therapies with stem cells, are reinforced through the contribution of both institutions. The Institut de la Màcula-BMF tandem represents a hub of knowledge, innovation and first-class treatment in degenerative retinal diseases. This hub is connected to the leading institutions in the country and in the world. Over these 10 years, the Institut has been incorporating other specialities. Why? Our vocation has always been to be among the best in AMD pathology, but we cannot leave other eye pathologies to one side. Our patients ask us for this and we must be receptive to what those who place their trust in us require in the field of ophthalmology. This is why we have three leading units, with specialists who have been trained abroad: Glaucoma, Cornea and Plastics. Our team possesses experience that has been acquired over the years in other centres, both here and internationally. Of course it has! The team of optometry, nursing and patient care has greatly increased in size. I’m really happy with them. I would like to highlight their professionalism. They are empathetic and affable and they know how to listen. It is a privilege to have a team like this. We wouldn’t be where we are if it wasn’t for everyone’s commitment to the patients and the excellence of the service they provide. And, as we are celebrating 10 years, I would like to thank all those who have accompanied us for their collaboration on this path: our usual suppliers, pharmacists, CROs and organisations with which we have worked in other projects. And also from the Teknon Medical Centre, the Teknon Foundation and the Clinical Research Ethical Committee. We have shared our journey with all of them. Over this decade, the Institut have also grown in space. How has this affected you? Our present building has greatly helped us in the creation and consolidation of these new areas. The comfort of patients, the use of the most innovative techniques and treatments in the various specialities place us at the forefront of knowledge. Is the extending of the care provision accompanied by growth in the fields of research? At first, we focused research on retinal degeneration but this has changed now too. Today, the Institut’s entire medical team present the results of their research at international congresses. We also publish in significant scientific journals. An article on glaucoma by Dr. Marta Pazos has just appeared in Ophthalmology while I, in conjunction with other co-authors, have had a new hypothesis on progression to geographic atrophy published in Ophthalmology Retina. The two journals are international benchmarks in the field of ophthalmology. The Institut de la Màcula’s current medical team. From left to right, Dr. José Nieto; Dr. Lucia Ferraro; Dr. Marta Pazos; Dr. Jordi Monés; Dr. Paula Verdaguer and Dr. Anna Sala. The vocation of your research is a global one. How does this desire materialise itself? As I said before: by creating associations with partners throughout the world. We form part of European projects, thanks to the Seventh Framework Programme and Horizon 2020, and we will continue to explore and build collaborations with other institutions in Europe and the rest of the world. Today, we form part of projects that we would have regarded almost as science fiction had we presented them 10 years ago. The Institut de la Màcula, in collaboration with the Institute of Photonic Sciences (ICFO), has developed equipment that enables the eye to be explored at cellular level. This makes us an ophthalmological centre with expertise in the field of photonics. The BMF, with the EYE-RISK project, offers insight into the mechanisms of atrophic AMD in a research consortium that groups over 8 benchmark centres in Europe. And, finally, we collaborate in the definition and development of regenerative therapies with stem cells in different projects, in collaboration with the Centre of Regenerative Medicine in Barcelona (CMRB), Centre for Genomic Regulation (CRG) and the Blood and Tissue Bank, among others. And now? What is the plan for the next 10 years? We are persistent and coherent. The consolidation of the specialities of retina, cornea, glaucoma and plastics in this first decade has already brought us several major achievements. All our team are sharing in exciting projects that we will be implementing in the near future. We are a medical team with a desire to innovate and progress further down a route that each day brings us more challenges, whether due to the breathtaking progress of the new technologies or to the new requirements of our patients. We don’t know everything, but we learn from the best, with whom we also share our knowledge so we can generate more knowledge and transfer it to clinical practice as fast as possible. I’m convinced that in 10 years we will find ourselves in scenarios that are unimaginable today, but they will always be in line with our vision: to make progress in eradicating forms of blindness. So that no known pathology will bring inevitable consequences. We have science on our side.